It was already my 8th CCI conference I attended, starting in Wroxton (UK) in 2007 in my responsibility as editor of CCIJ. In 2016, this year was the first time that I was not responsible as editor, and I enjoyed seeing my replacer, professor Timothy Coombs (A&M University) taking all the responsibilities at this conference that used to be mine. The CCI conference is a well established conference that had his 15th edition. 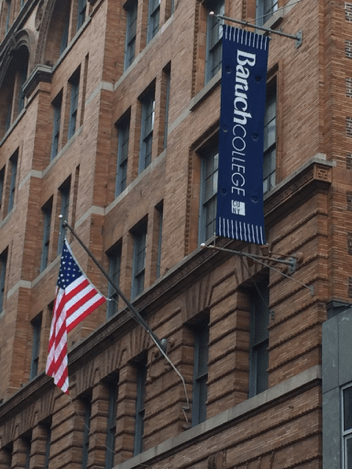 Corporate Communication International was founded by professor Michael Goodman at the Fairleigh Dickinson University, and transferred with professor Goodman when he changed to Baruch College. 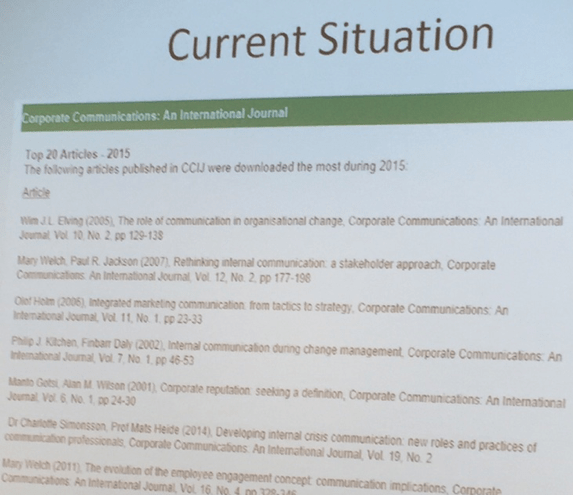 CCI is sponsor of Corporate Communication, an International Journal. For many years’ special issues appeared from the conference, a model that was changed in my last year of leading the journal. The conference is a mixture of practice and academic (praxis) with participants from all over the world. ASCoR is one of the academic partners of the conference, especially because of my long lasting presence and involvement. Other academic partners are the corporate communication departments of the Universities of Aarhus, Aalto, Singapore, Lund, Hong Kong and Johannesburg. The conference had some very interesting presentations and keynotes. I would like to mention Andy Whitehouse, CCO of IBM, who highlighted the amazing increasing amount of digital information, of which only 20 is structured and ready to analyze, with the other 80% remain unstructured. Organizations need help to be able to analyze the 80% unstructured data. Another interesting presentation was by Peter Cardon, in the Association for Business Communication panel. Peter presented his study entitled the role of leadership communication and emotional capital in driving internal social media use. He showed us that emotional capital was vital in the efficiency and success of organizations, and that social media can be a very constructive tool. ASCoR had two presentations at the conference, one dealing with organizational change, based upon the paper published in CCIJ in 2005. The other paper, work of Ward van Zoonen attracted much attention, despite the fact that it was in presented in the last session. This research deals with the dark side of social media and the difficulties for employees to be online 24/7 as part of their work, and joined responsibility as a family member or friend. This did resonate very well with the audience, many experienced problems that were central in the paper as well. Three journals besides CCIJ were present, the journal of Association of Business Communication, International Journal of Business Communication (IJBC), the Journal of Communication management, with Jesper Falkeimer from Lund University, who took over recently the editor in chief position from Anne Gregory, and presented Ansgar Zerfass (Leipzig U. & Oslo U.) 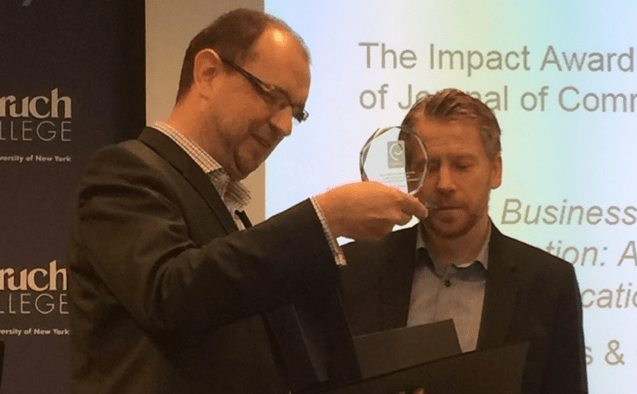 the best paper award on behalf of JOCM. CCI is a good conference, good atmosphere for both academics and practitioners. ASCoR can be proud to be partner of the CCI-conference.